Hoverboards are technically illegal in New York City, but if you ride one, or are lucky enough to get one this holiday season, chances are you have nothing to worry about. Even though you can be fined up to $200 for riding a self-balancing board in public, the law has not been strictly enforced. The legal status became an issue in November when the 26th Police Precinct in Harlem wrote, then deleted a tweet reminding people that hoverboards were illegal under a code—which ended up being incorrect. This led to some confusion. The actual law that makes hoverboards illegal is under New York State Vehicle and Traffic Law, Article 14, sections 401-a and 401b that prohibits Segways and other motorized vehicles (for example, hoverboards), because they cannot be registered at the Department of Motor Vehicles. 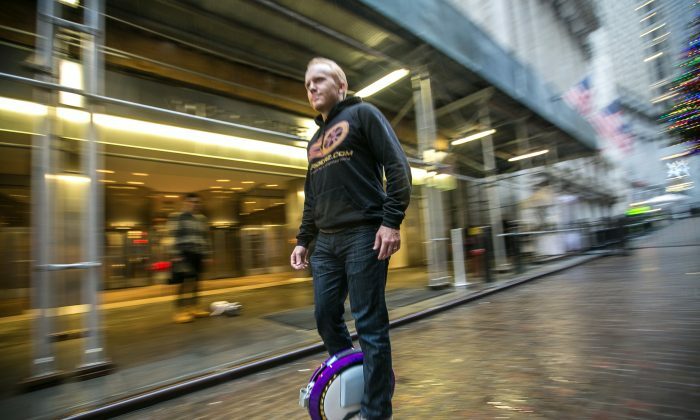 An NYPD spokeswoman confirmed that any “motorized self-balancing device” or “personal transporters” are prohibited in New York City. The New York state motor vehicle law only applies to any county or city that has a population over 1 million—New York City is the only city that meets this criteria. Despite the ban, enforcement has not been a priority for police and only causes confusion among riders. Some lawmakers are working on a bill that would lift the ban and end the confusion. Hoverboards, also known as self-balancing scooters or mini-Segways, don’t actually hover (they have wheels) and can be ridden like a sideways skateboard, reaching speeds of about 10 miles per hour. They cost anywhere between $200 and $2,000 and are a popular gift this year—on Cyber Monday eBay sold nearly 7,500 hoverboards, or 1 every 12 seconds. While there have been some fines issued on hoverboard use in the city, it seems that most police officers are unaware of the ban or are turning a blind eye. Tim Haden, founder of Hoodriderz an online retailer for personalized transportation, rides his single-wheel transporter daily. “To date none of the riders in our community have been stopped by the police and ticketed for riding their hoverboards,” he said. Haden believes police have bigger problems to worry about. “I have been pulled over by the police before on three occasions, but they’ve asked me ‘Where can I buy one?’ … One police officer happened to be in a car at the time and I was riding on the sidewalk,” he said. 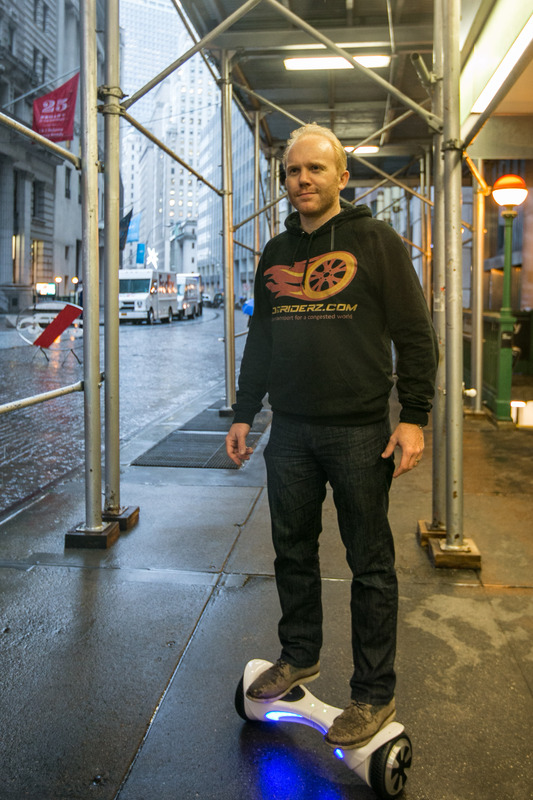 Haden organizes weekly group rides around Central Park and describes the hoverboard community as passionate folks. He said he often asks police about the legality of riding them. “Whenever we do get stopped by police we always ask them about the illegal status and we get an ‘I don’t know’ or an ‘As long as you’re safe’ kind of answer,” he said. Haden said news of the hoverboard ban did not impact his business, instead he received increased interest and more phone calls. “People have a lot more concerns over the safety, given the fires that have happened recently,” he added. There have been increasing reports of hoverboards catching fire, likely due to their lithium-ion batteries. The United States Consumer Product Safety Commission is currently investigating the hoverboard fire hazard issue. Hoverboard riders are not the only ones against the ban, some lawmakers also oppose it. State Sen. José Peralta wants to eliminate the confusion by passing a bill that would define the hoverboard in its own class. The bill will exclude hoverboards from the definition of motor vehicle under current law, thus lifting the ban in New York City. “Riding these devices should be legal because they are nothing more than skateboards with electronic engines. It makes no sense to harass hoverboard riders,” he stated in an email. How do we have an interaction with them without violating people or even criminalizing people? New York City Council member Andy King, is also working with Peralta on the legislation. King said this holiday season there’s going to be a lot of young people out there on hoverboards. “How do we have an interaction with them without violating people or even criminalizing people?” he said. King added that most of the people who would get fines would be teenagers. “I don’t want a 9- or 14-year-old getting a fine for riding on a gadget because it’s not legal in the city of New York,” he said. The bill will be up for discussion in the next legislative session, beginning in January.